The story of Lisinia and Ozturk Sarica who passed his childhood with natüre and his family lived in Akcakoy in Yesilova, Burdur for long time began with “Juniper” that he was affected so much when saw for the first time. When he sees how Juniper consumes less water, maintain life in most barren and wetland areas, hosts and sees people that he thinks as a symbol of living, resistance and endurance in the most negative conditions. When he grew up and began to read a book, he learnt perfect harmony between Fieldfare and Juniper. Seeds of Juniper on the ground invigorate in the digestive system of fieldfare and it pullulates after threw out of fieldfare. Sarica who sees the eternal harmony between all living and non-living beings, especially in last 30 years the pollution of nature and the cancer as a result of its reflection, decided to roll his sleeves up to maintain natural life which, he devoted himself, and to transfer to next generations. After 3 years of permission works Lisinia is formalized as one of the first Wild Life Centers of our country. 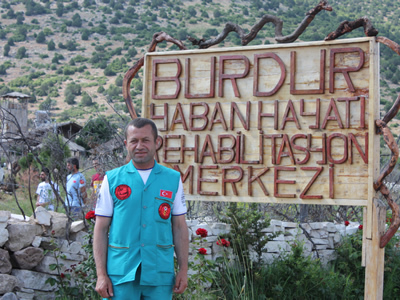 At the same time all expenses are granted to Ministry of Forestry and Water Affairs for 10 years by Ozturk Sarica. Since its foundation, Lisina Nature has been performing works with 8 different projects by developing and getting varied.